When I studied abroad in Madrid, one of my biggest worries was the apartment hunting. We would be in dorms for two weeks, during which we'd have to find - on our own - an apartment to live in for the year. How am I going to find an apartment in this big city that I've never been to before? And do it in Spanish?! Well, I did it! I found a great, affordable apartment that I was happy in all year. And you can, too! Here are some tips and information to help you on your apartment hunting. Get excited, because you're going to find a great apartment and have an incredible time living in Madrid! When looking for housing, you can either rent una habitación (a bedroom) from people who already have the piso (apartment), or rent a whole piso with others. I would recommend not renting your own apartment as a new expat, because the contract would most likely be for at least a year, and you would have many legal obligations by having the apartment under your name. Rather, I suggest renting a room from someone who has the apartment in their name; there are tons of these types of rooms for rent in the city, and it's what most expats (and many Spaniards!) do. The habitación might be in an apartment of students, workers, and sometimes even families or widows will rent out an extra room in their flat to help pay the rent. If you're completely new to the city, first you need to familiarize yourself with Madrid and its many barrios (neighborhoods). Two years ago I lived near the metro Ventas, in the barrio Salamanca and absolutely loved the area. Calle Alcalá is my favorite! My apartment was an exterior, which means that it is on the outside of the apartment complex, so the windows look out onto the main street. An apartment can also be an interior, which means it's on the inside of the building, so any windows will look to an inner patio where the laundry lines usually are. Regardless of the type, make sure your room has a window! It wasn't until after I had moved into my piso that I found out Salamanca is apparently the wealthy neighborhood of the city. I couldn't believe it, since I'm so frugal, but I had found a great rent price for where I was living (320 euros / month, all utilities/internet included). 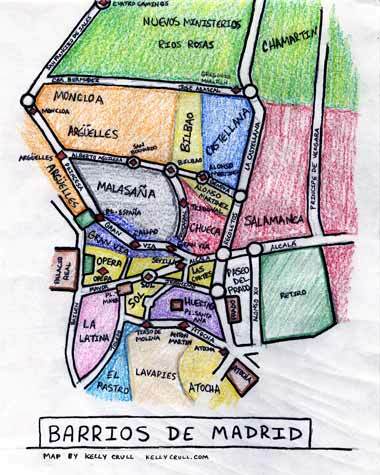 If you're out walking around while soaking in the different barrios, keep your eyes peeled for "se alquila" signs -- which are everywhere. Many people put up signs with phone numbers when they're renting a room. Rip off a number and start collecting them! Sometimes apartment doors themselves will have a "Se alquila" sign with a phone number posted up next to the building number, or up on a balcony. If you like the area, you can call the numbers while you're there to find out more information. Segunda Mano - You can browse by district. Idealista - You can browse by district. Easy Piso - This one lets you make a profile, where you write what kind of apartment you're looking for, tell a little bit about yourself, and upload a picture. It's actually nice though, because you can be sent e-mail notifications when new apartments are posted that are in your price range/location of choice. Also, people renting rooms can contact the room-searchers they want to live with, so you will probably have a better chance of finding roommies you'll get along with. Loquo - Unfortunately not organized by district, but you might find something on here that's not on the other sites, so I still used it. Campus Anuncios - Select "habitación en alquiler" and you can set your maximum/minimum monthly price. Don't forget to select Madrid as your location! The next step is to call places you're interested in to get more information. You will be amazed at how little some people write in their posts. Don't send e-mails -- the people who call will beat you to it and get to look at the piso before you ever receive a response via e-mail. 4. ¿Hay calefacción? ¿De qué tipo? ¿Es central o individual? (Is there heat? What kind? Is it central heating or individual) If it's individual, ask ¿de gas o eléctrica? 10. ¿Soy de los EE.UU., hay más norteamericanos en el piso? ¿Hay más extranjeros en el piso? (I'm from the United States, are there other North Americans in the apartment? Are there other foreigners in the apartment?) Things I would be sure to ask ahead of time if you're looking to live with Spanish speakers, which is highly recommended to improve your language skills. Find out as much as you can on the phone before you decide to so visit a place. Seeing an apartment does take a decent amount of your search time, so only go see the places you're really interested in, that meet your top qualifications. This means make sure you've asked about all of your questions or concerns before you go see a place, so you don't arrive and find out there's no window, for example. Don't be afraid to ask the person to repeat or talk slower: Por favor, ¿Ud. puede repetir lo que dijo más despacio? If you want them to spell you a street name or other information, ask ¿Cómo se escribe? I would write all your notes from piso-hunting in a notebook. It gets quite confusing with all of the different ads -- some you'll find on multiple websites, others you'll see only once, and some will get re-posted every couple of days. To keep track of which places you've already called, which were already rented, etc., write it all in a notebook. And remember to go with your gut! This is where you'll be living every day, so you want to feel comfortable and have an honest/helpful landlord. If something doesn't feel right about the apartment, keep looking! You'll find a great fit!